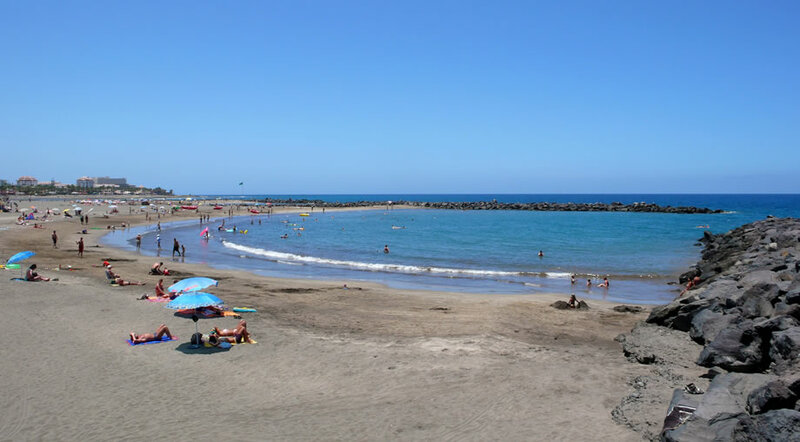 Troya beach is the most popular beach in Playa de las Americas, with many shops, restaurants and hotels in close proximity. Divided between Troya I and Troya II, this is the party epicenter in Tenerife and a favorite place for all tourists. During the day, Playa Troya welcomes visitors with its calm waters and many facilities, like sun beds, umbrellas and showers, including a banana ride for kids. At night Playa Troya is famous for its raging parties which set the tone for all the island’s clubs. With fine and dark golden sand, Playa Troya was awarded the Blue Flag beach distinction welcomes tourists with ideal conditions for both sunbathing and swimming. Troya beach is the ideal place to relax and enjoy the beautiful weather that Tenerife has to offer. If you are looking for more activity, there are plenty of options for watersports like paddling or parasailing or maybe jet ski rentals for more adrenaline. You should expect lots of crowds all year long, since Playa de las Americas is the busiest resort in all of Tenerife. However, the beach is popular for a reason, and it’s because of the great location and all the amenities you can find in one place. For a more quiet day out in Playa de las Americas you can opt for Playa Camison, situated at the south end of the resort. From Playa Troya you can walk on the promenade towards Los Cristianos or in the opposite direction towards Costa Adeje and Playa de Fanabe. If you like to be in the heart of the action, this beach is the place to be: you will find many shops and restaurants in the first line and plenty of hotels situated right behind the promenade.